Images via Penguin Random House and AP. “How can I show you the hole in my heart? 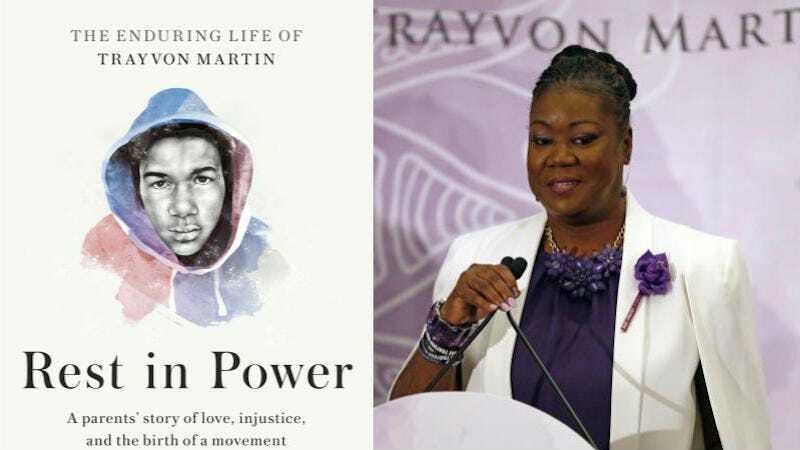 How do I write about the death of my son?” Sybrina Fulton opens her book, Rest in Power: The Enduring Life of Trayvon Martin. The book, co-authored by Fulton and Tracy Martin, tells the story of their son, Trayvon Martin, the 17-year-old killed in Sanford, Florida in 2012. The book, which comes nearly five years after Trayvon’s murder (he would have been 22 this month), is a deeply personal account, the story of an average Miami teenager who became a flashpoint for race and justice. Fulton writes of the Trayvon that she raised and loved; the well-known photograph of her son in his hoodie—the one that became the iconic image of Trayvon—is rendered on the book’s cover but framed by Fulton’s knowledge and words, rather than narratives that fueled the often ugly coverage of Trayvon’s death. Rest in Power, told in alternating chapters by Fulton and Martin, recounts not simply the story of Trayvon’s murder, but the equally important story of his short life. In Fulton’s rendering of her son, he’s just a teenager who cares about his style (shoes, hoodies, and cologne), endures the typical teenage growing pains, and loves his family. He’s just a kid. Rest in Power is a heart-wrenching account and an important history that should be required reading. I spoke to Fulton on the eve of her appearance at the Miami Book Fair. Our conversation has been edited for clarity. Jezebel: Can you talk a bit about what motivated you and Tracy Martin to write the book? Sybrina Fulton: We wanted to make sure that we told our tragic story through a parent’s points of view. I understand there are other books that are about Trayvon but they’re not from our perspective. We wanted to give readers an eyewitness account of what we went through; how we knew Trayvon, who Trayvon was. We wanted people to see Trayvon growing up, him around the house, him just around the family and his friends. Then his tragic death. We struggled to get answers from the police department about the death of a 17-year-old that any parent would have wanted. The struggle that we went through with the medical examiners; what we went through at the trial. We wanted people to know what it’s like to sit through a trial for the death of your 17-year-old son while the person who shot and killed him went home and got in his own bed. Rest in Power speaks to parents whose children are victims of gun violence and to parents who have lost a child through an illness or a car accident or maybe even a suicide. It speaks to those parents because the same loss that I feel, the same hole in my heart, is the same hole that’s in their heart. You write in the book that, at the beginning of your son’s case, it didn’t seem to you to be about race, that you thought that people would see his case simply as two parents wanting justice for their lost son. You write,“at first I felt that our case had little to do with race... at least whether people would find the story sympathetic or not [...].” You come to have a major shift in that perspective. Would you take us through that journey? When the incident first happened, we didn’t have a clear picture of everything because we weren’t getting any answers from the police department. The Sanford Police Department continued to tell us that they had an open investigation, at the same time, we were concerned parents who wanted to know what happened to our son. We weren’t asking for any special treatment. We just asked for what any other parent—no matter race, color, ethnicity, background—would also ask. We felt that it was unfair. Still, at that point, we didn’t know it was about race. It wasn’t until a few things transpired that we realized it was about race. One of the things that transpired is that the person who killed Trayvon was able to leave the police station and go home and do whatever he wanted. He wasn’t restricted and he didn’t have to stay at the police department. We know—and you know, as well—that if Trayvon, a 17-year-old, had shot and killed that man, he would have been sitting in jail. We didn’t understand why that arrest took so many days. A crime had been committed. That was one of the things that was so frustrating. During the time that we were grieving, we had to continue to fight. We had to fight on every issue about everything. Even getting Trayvon’s body released was a problem. It was so many things and it all went back to race. We later found out through our attorney’s office, that the [housing development where Trayvon was killed] had a series of break-ins and they were looking for an African-American kid or man or person. But it wasn’t Trayvon. It wasn’t Trayvon. He picked the wrong kid because it wasn’t Trayvon. This guy decided that he wasn’t just going to be the neighborhood watch captain but that he’s going to take the law into his own hands and attempt to trace Trayvon. Trayvon was definitely profiled. The killer was looking for an African-American person. It was a mixture of so many things that we felt were unfair. If the tables were turned, if Trayvon had been a white American, it wouldn’t have happened the way that it did. You write about, at first, not wanting to go to Sanford and then feeling this anger at the injustice that initially motivated you to go fight while you were grieving. That feeling is very balanced in the book with your account of faith. You write extensively about your deep faith and relying on it in some of the worst moments, including hearing the verdict. I was wondering if you could talk about your faith in these moments? When I realized that they weren’t going to arrest the person that killed Trayvon because of the Stand Your Ground law, that night, anger set in and I immediately packed my bags and got on the road and headed to Sanford. I needed to know why. I needed answers. I needed to know why the person who shot and killed Trayvon wasn’t going to be arrested. I didn’t understand a thing about Stand Your Ground. I didn’t understand why they couldn’t see that my son was an unarmed 17-year-old who wasn’t committing any crimes. I was always a person who grew up with a strong belief in God. I believed that God was going to carry me through this, even when I was weak and at my darkest point. I feel relieved that God was there, he was never going to leave or forsake me. I feel grateful for the people that were around me, my church family, my family, and my friends. I had all of these positive people around me who continued to lift me up. That’s what got me through. One of the things that’s really striking about Rest in Power and your chapters, in particular, is that through everything, you constantly see good, these small moments of grace. And not just from the kindness of well-known people who spoke on Trayvon’s behalf. At one point, you thank employees at the Pembroke Lakes Mall where you were buying suits and business clothes for court appearances and interviews. I was wondering how you continued to see those moments of grace in the midst of your grief and the very ugly things being said about your son? I just think that there are a lot of things that are important in life and somebody’s negative opinion about me is not important in life. I don’t give that a lot of attention. I don’t give it a lot of value. I decided to focus on what I’m doing. I’m focused on the Trayvon Martin Foundation. I’m focused on what I need to do to get my life back in order. I don’t pay a lot of attention to those things. You have people that pay a lot of attention to negative things that people say, but that distracts you from what you need to be doing. I won’t allow those things to distract me. I stay focused. I’m human, so every now and then, I might listen to the naysayers but, for the most part, I try to stay focused on what I’m doing. I keep my circle small. I keep people around who are lifting me and not bringing me down. I try to keep those people in close proximity. You brought up your continued work with the Trayvon Martin Foundation. You write in the book that this incredible tragedy gave you “purpose” and “a mission.” In addition to the Foundation, you formed Circle of Mothers and are a member of Mothers of the Movement. Can you talk a bit about the work you continue to do with those groups? The more I continue to help people, the more I take the focus off of my pain and my hurt. It’s important to me that I help other mothers, that I reach out to other families. It takes the focus off of what I’m going through and it helps them, it helps them move forward and encourages them. Even if I can only say a prayer or some encouraging words, it actually takes the focus off of what I’m going through. Maybe it’s a healing mechanism, I don’t know what to call it—I’m not expert on this. I’m simply talking in the book about what I did and what got me through. As far as the Mothers of the Movement, those mothers are very strong women, very motivated mothers and they want to be part of the change and see something happen. We were part of Hillary Clinton’s campaign and we spoke on behalf of Secretary Clinton. We stood with her because she stood with us. That was important to us, no other presidential candidate reached out to us and listened to our family tragedies. It’s not just a story for us, these are our tragedies, this is the life we are living. We [Mother of the Movement] don’t want anyone else to have to stand with us because this is an awful sorority to be in, an awful group to belong to. We try to do our best to make a positive change in our communities and in the world. As far as the Trayvon Martin Foundation, we really try to spread awareness of gun violence and reach out to other families. We do a lot of mentoring, too. We want to bridge that gap between our young people and law enforcement.